Only the bravest dare to call themselves heroes in the dangerous lands of Mennara. Once, long ago, mighty heroes stood against evil and disaster. They are gone now, and though some have emerged to take their place, it is not enough. Heroes are needed now more than ever, or Mennara shall be lost forever. These heroes will have to use wit, courage, and extraordinary abilities if they hope to stand a chance of surviving this deadly world. This rich fantasy setting, ripe for adventure, awaits you in Realms of Terrinoth, a new campaign setting sourcebook for the Genesys Roleplaying System! 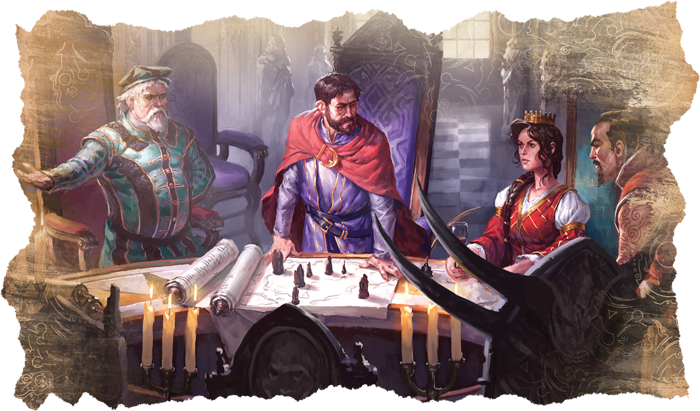 set in the world of Descent, Runewars, Legacy of Dragonholt, and more! Join us today as we preview Heroic Abilities, a new mechanic found in Realms of Terrinoth, and don’t forget to pre-order your copy from your local retailer or our website today! Heroic Abilities are powerful actions used as incidentals during combat. These abilities represent what makes your hero unique—through a backstory that you develop, your Heroic Ability comes to life. As your character grows in experience, they receive ability points, which you can spend on upgrades that further customize your character’s Heroic Ability. Creating a unique Heroic Ability is easy, and can be done in three steps. The first thing you do when creating a Heroic Ability is choose its primary effect. The primary effect is the core of your Heroic Ability, and it commonly lies close to the core of your hero as well. The primary effect defines what happens when you activate your ability, and even at a base level, these effects are potent and come with a cost. By default, activating a Heroic Ability requires you to spend two Story Points. The effects of the Heroic Ability last until the end of your character’s next turn, and you can only activate it once per session. 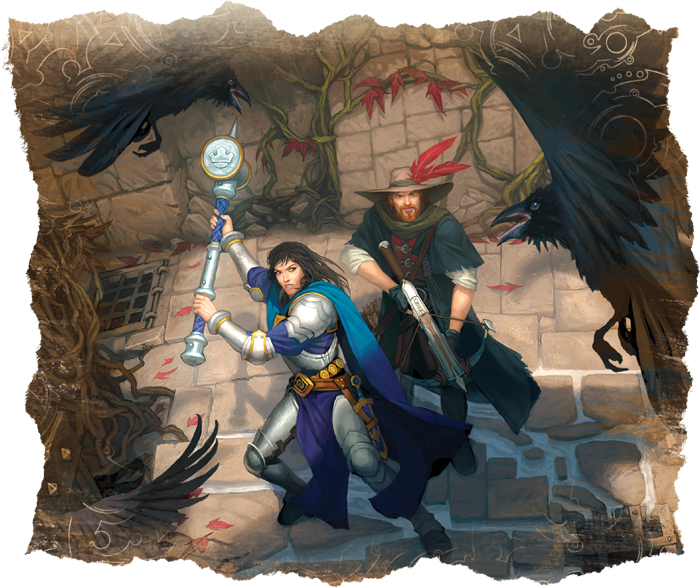 Realms of Terrinoth features a huge list of possible abilities, from having a sixth sense about a certain subject to using a signature weapon. These abilities are perfect for the fantasy realm of Terrinoth, but they can also be used in other appropriate settings. 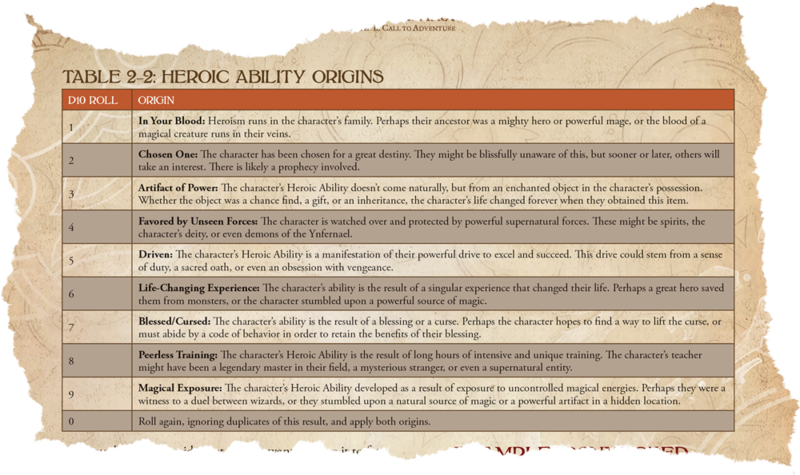 For example, Heroic Abilities are what make super heroes "super," and they can be the focal point of a super-powered campaign. Of course, you should feel free to work with your game master to craft your own primary effect. When deciding on a primary effect, look to your character’s concept and what you know about them already. Their Heroic Ability is central to who your character is, and why they adventure. Jayda is ready to choose a Heroic Ability for her character, a Warrior of humble birth named Aidira. Aidira desires to be a knight, even though she was born a commoner. Jayda hasn’t quite decided yet how Aidira became such a skilled swordswoman, considering her origin, but wants a Heroic Ability that represents her ability to quickly dispatch foes. She decides on the Unleash ability, which allows Aidira to perform a maneuver to immediately defeat one minion group in short range on her turn. Your Heroic Ability helps define your character, and its origins can be just as important as its abilities. Working with the GM to develop a unique backstory for how your character learned their ability will help to flesh out and develop your character’s history. Of course, Realms of Terrinoth also provides an easy way to kickstart your imagination and use fate to determine the origins of your abilities with a handy table. Jayda decides to use the provided table to come up with an origin story for her Heroic Ability. She rolls a "9" for the ability’s origin, obtaining a result of Magical Exposure. Based on this, Jayda decides that Aidira first took up a sword to defend her family from a dark wizard and was struck by a discharge of magical energy at the same moment she dealt a fatal blow to the wizard. Ever since, in times of similar desperation and bravery, Aidira has exhibited heightened reflexes and preternatural skill with a weapon. After your Heroic Ability's primary effect and origin have been determined, the final step is to give the ability a unique name befitting your character. This adds an additional layer of characterization to your ability and truly makes it your own. And, it's an opportunity to flex your creative muscles and give some extra character to your ability. Now that Jayda has determined her character’s Heroic Ability and answered questions about Aidira’s background, she decided to call the ability Echoed Power. This helps set the tone of the character she is trying to create and adds a unique flourish to Aidira. Once this step is completed, the creation of your Heroic Ability is complete. But as you travel on your adventures, you will find the challenges you face not only change your character, but your abilities as well, morphing them into something new. Through training and determination, your character gains ability points that can be used to improve your Heroic Ability by removing restrictions or increasing its potency. For every 50 XP that you gain, you may gain one ability point. These points can be used to improve the base effect, increase its frequency, duration, and more. For example, “Hard to Kill” is a Heroic Ability that allows your character to shrug off the worst an enemy can throw at them. When it's activated, it increases your character's soak by four until the start of their next turn, greatly reducing the damage they would receive from even the strongest attacks. While this is a powerful ability, its power can be increased to make it even more potent. Every Heroic Ability has an Improved and Supreme ability. Spending one ability point upgrades an ability to its Improved version, while it takes two points to upgrade an ability from Improved to Supreme. 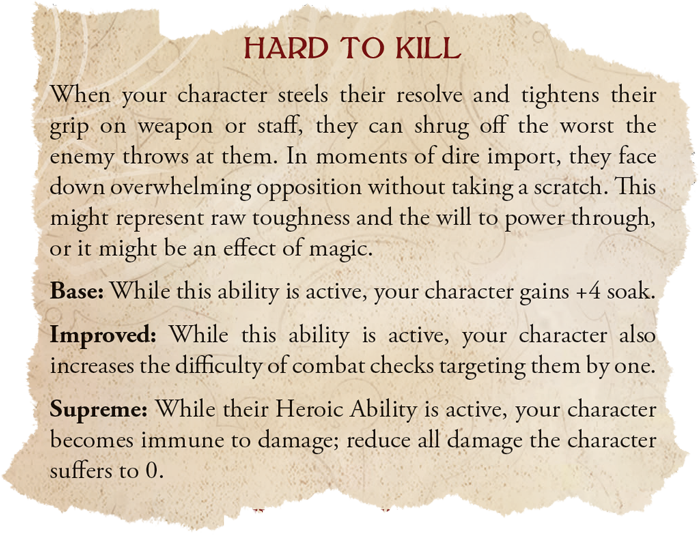 For example, the Improved Hard to Kill lets your character increase the difficulty of combat checks targeting them by one. While this makes your character even harder to hit, you may spend an additional two ability points to gain Hard to Kill's Supreme ability. Under the Supreme effect, while your Heroic Ability is active, your character simply becomes immune to all damage. This ability is certainly heroic, allowing your character to take any attack the enemy can throw at them, no matter how powerful. Heroic Abilities like this elevate your character from hero to legend. Or perhaps your character has some sort of Sixth Sense when it comes to a certain subject, whether it is animals, the dead, or even the human mind. When choosing this Heroic Ability, you and the GM determine what your extra sense applies to, and when this ability is active, your character can communicate in a limited fashion with this entity. The Improved version allows you to understand and exchange simple ideas with your chosen entity, and the Supreme ability allows you to engage in complex conversations with the chosen entity. Increasing a Heroic Ability’s power provides a unique effect for each individual option, but there are several universal options that can buff your Heroic Ability. For example, spending an ability point to increase the duration of a Heroic Ability lets it stay in effect for an additional turn. And because these bonuses can stack, you may purchase the duration bonus multiple times to make your heroic ability last an additional turn for every bonus purchased. Throughout the game, your Heroic Ability may shift and change as your character explores the realm of Terrinoth. You may also spend ability points to give your Heroic Ability a secondary effect. You may decide that your ability is devastating, meaning while it's active, your character adds two damage to one hit on each of their attacks. Or perhaps your ability is inspiring and empowers your allies, giving all allies within short range a boost die for their skill checks. Realms of Terrinoth provides a handy list of secondary effects, but as always, feel free to work with your GM to come up with an effect that’s truly unique. In Terrinoth, it takes more than just strength to survive the most dangerous areas of Mennara. It will take cunning, instincts, and bravery to rise above the evils of the world and truly become heroic. Is this the path you will walk? 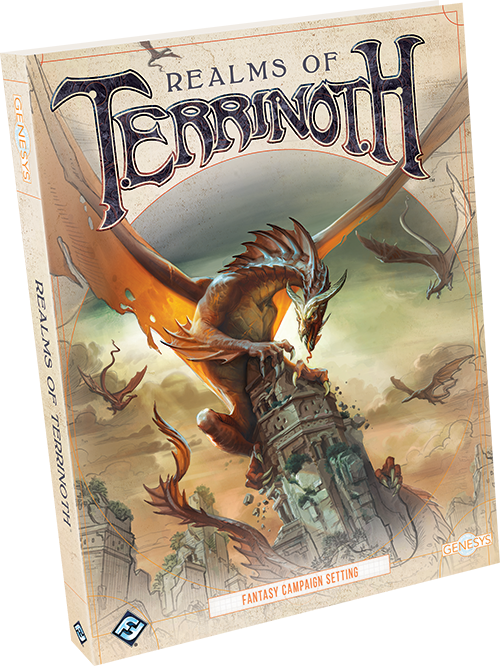 Become a hero with Realms of Terrinoth (GNS03), available for pre-order now from your local retailer or our website!